The people of Latin America have long fought for the right to their cast vote as a sign of the long struggle for self-determination. After centuries of external subordination during colonialism and decades of military repression during the 20th century, today, elections are fairly free and transparent in most democracies of the region. In the Bolivarian-socialist governed Venezuela, however, it takes a hunger strike by an incarcerated leader of the political opposition to pressure Hugo Chávez’s successor, Nicolás Maduro, to set a date for parliamentary elections. Eventually, the Venezolanos are asked to the polls on December 6th this year. Two years after the death of the charismatic Hugo Chávez, the government of President Maduro faces record low approval ratings of only 21.3%, according to the polling institute Datanálisis. The opposition, though divided, can count on 40.1% support of the electorate. Nevertheless, dealing with officials in Venezuela is nearly impossible. For example, the government declined to publish a number of official economic and social reports, such as the annual homicide rate. In stark contrast, however, the multi-faceted challenges ahead for Maduro to secure his re-election are more transparent. Venezuela, especially Caracas, has experienced years of continuous violence, causing the wealthy inhabitants to retreat into private gated communities. Ad-hoc kidnappings, in which people are randomly held hostage and released hours later after the ransom is paid, have become more common. Consequently, the vicious cycle of real, and perceived, violence has reached the lower and very small middle class. Hardly a day passes without a homicide, even on the densely populated streets of Caracas. , Most inhabitants have lost faith in a visible amelioration of the security. 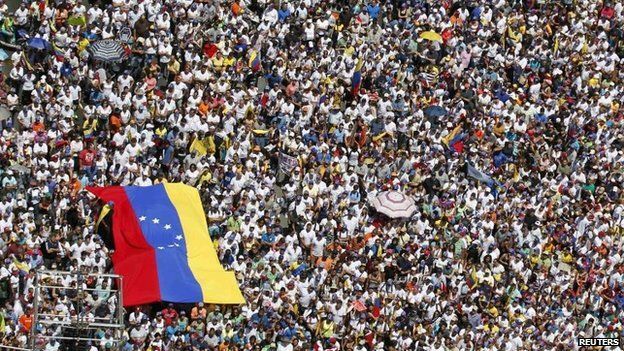 While urban violence has accompanied the daily lives of far too many Venezolanos in the past, massive queues in front of the supermarkets have led to mounting protests. President Maduro places the blame squarely on multinational private companies, alleging that they withhold goods to provoke an uplift of the prices on the expense of the population. In the past weeks, the food shortages have been exacerbated by local gangs, called bachaqueros, that hoard subsidised food to feed the black market or export it to neighboring Colombia. Off the back of the mushrooming black market, food prices have reached four to five times the official prices; this is especially bad news especially for the poorest, who receive free food. . These developments stand in stark contrast with the reports on June 8th that the United Nations Food and Agriculture Organization, FAO, had distinguished Venezuela’s “notable and exceptional” efforts to reduce malnutrition and increase the daily meals offered through food subsidies, mainly for children in schools. According to official government statistics (to be interpreted with caution), malnutrition was reduced by four-fifth since 1990, whereas the children’s rate was halved. Thus, the speech by the President of the FAO was warmly welcomed by the troubled Venezuelan government. Graziano da Silva, the Head of the FAO, congratulated Venezuela for exceeding the UN’s Millennium Development Goals (halve the percentage of people suffering hunger by 2015). Notwithstanding, such positive news will be forgotten until the elections in December, where it will not be the FAO securing Maduros’ continuation in power, but the queuing population. Shall el Presidente prove unable to fill the stacks in the supermarket, a re-election will be tough. In addition to supply shortages, increased efforts will be needed to propel the economy and stop the growing inflation. Simultaneously, Venezuela struggles with an artificial devaluation of its currency. A rise in the price of oil on the global market would be a blessing, not only for the OPEC member Venezuela, but to Maduro himself, who would gain more room to maneuver for his promised social policies. That this is badly needed becomes obvious in the latest cautious rapprochement with the arch enemy, the United States, in the hope of attracting investors. Such political moves constitute a dangerous tightrope, which diminishes the rhetorical credibility, upon which Maduro depends heavily. The approximation of the Americas, though welcomed and necessary as in the case of Cuba, could thus constitute a zero-sum game in which either the electoral base or the diplomatic ties between the two members of the Organization of American States (OAS) will benefit. Nevertheless, as close elections in December become more likely and when push comes to shove, Maduro is likely to sacrifice the slow advances with the United States to please his socialist base. Maduro’s fortune will highly depend on the divisions among the right-wing opposition. The successes of collecting 49% in the last presidential elections by the ex-candidate of the Mesa de la Unidad Democrática (MUD) has proven Henrique Capriles as one of the most experienced among the Maduro’s political rivals. Feistily Capriles announced, “the Venezuelan opposition finds itself in better conditions today.” Nevertheless, the opposition parties disagree on the means to pile the pressure on Maduro’s Partido Socialista Unido de Venezuela. Evading the forceful repression of the political opposition would not only reduce the anger of the students and inhabitants on the streets of Caracas, but also delegitimize the attempted isolation by conservative voices in the United States.